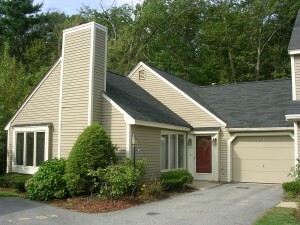 The Village at Brickett Hill is located in the northern part of Haverhill just before the New Hampshire border off North Ave with 234 town home style units built be Yvon Cormier Construction during the mid to late 1980’s and early 90’s. The complex is reasonably close to highway access and shopping with the Haverhill Country Club located about half a mile away. The units came in multiple floor plans and sizes, some having basements and others having a slab. The complex is beautifully laid out with Brickett Hill Circle as the main loop were most units are located with Iris, Lilac, and Tulip Lane having less units. Landscaping is in abundance and provides a peaceful natural retreat feeling which helps with privacy and making the complex feel more like a neighborhood. As the complex is gated, and not a pass through street, the traffic is kept mainly to residents. Units are serviced by natural gas with a forced hot air system and central air conditioning. Some units have attached garages while others come with a detached garage bay. Each unit has at least 2 car parking availability. The association provides a swimming pool, tennis courts and a clubhouse for residents use. Pets are allowed with some restrictions. One interesting fact about this association is that window replacement is covered by the association. The fees at Brickett Hill tend to be on the higher side of comparable complexes in the area charging approximately $350 per month, however the quality of upkeep and amenities show that they are being used properly.